Believe it or not, this canvas is not written entirely by Rembrandt. The thing is, he just started this painting, and then suggested to his students to finish it. And if not strange students did not remember, but the teachers perpetuated again. But perhaps we can say that Rembrandt was the most chaste of all famous painters. Why chaste? But in the portrait you can see everything. Almost for the first time, Venus is not stripped, but dressed like that, in the clothes of the time of the author himself, and Cupid, if not for the wings, he would have looked like a simple little boy. But what a tenderness between them, what motherly love! And what is Venus itself! Where is slender and beautiful woman? There is no her, this slightly plump woman with a pretty face only vaguely resembles that Venus, which we all know thanks to Botticelli. 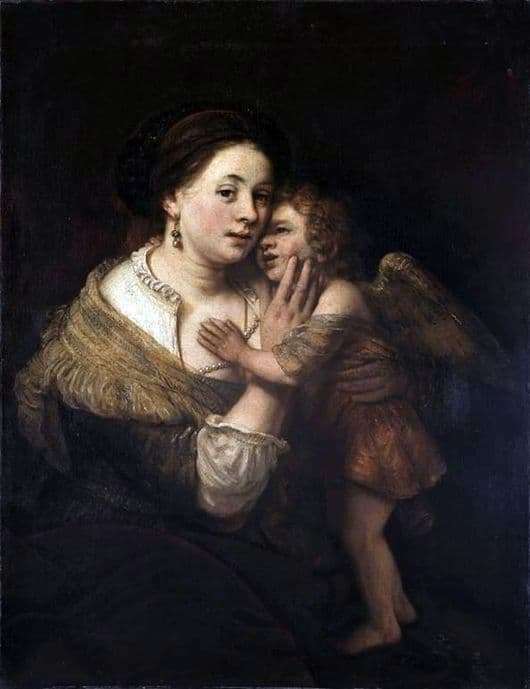 Only a face and no more… And Rembrandt figured out how to make visitors understand and believe that this is Venus with Cupid. He simply added wings to the baby. But the most pure Rembrandt is the design of the canvas. Nothing superfluous, only these two and those illuminated by the inner light of a person. But the “Return of the Prodigal Son” is almost the same: “two people – one on their knees, the other just stands by and looks down tenderly at his son… And that’s it! Nothing more, no background. So it is here – only Venus and her son, whom she gently holds in her arms, and he seems to be complaining to her or asking for help. Who knows what could have happened to the prankster Amur. And he is still that naughty! Just remember how much trouble was created because of his arrows! But this is a mother, she will not give offense, she herself is love, she herself is femininity, she herself is perfection! But there are still some errors in this canvas, and they are clearly created by the students. Pay attention to the hands, the impression that these are male hands. That is what gives authorship.